Is anything short of full autonomy really autonomous? Level 0: No driving automation. The driver is responsible for all tasks. Level 1: Driver assistance technologies. Technologies such as adaptive cruise control can control either acceleration/braking or steering, but not both. These are assistance technologies only, and the driver must control the vehicle. Level 2: Partial driving automation. The car can sustain control of acceleration/braking and steering only within specific environments (e.g. a motorway with clearly marked lanes). The driver is expected to remain alert and able to intervene at any time. The driver is also expected to supervise the automation system and to handle any hazards or other adverse events that may occur. Level 3: Conditional driving automation. The car can sustain control of all driving tasks (acceleration/braking, steering and other driving tasks such as changing lanes) only within specific environments (e.g. a motorway with clearly marked lanes). However, the driver is expected to respond and take control of the vehicle if the car warns the driver, or if the automated driving system fails. Level 4: High driving automation. The car can sustain control of all driving tasks (acceleration/braking, steering and other driving tasks such as changing lanes) only within a specific environment (e.g. a motorway with clearly marked lanes). Within this specified environment, there is no expectation that a driver will intervene. Level 5: Full driving automation. The car can sustain control of all driving tasks in all environments, unconditionally. There is no expectation that a driver will intervene. The main problem with this system is the terminology. In the ordinary sense of the word, 'autonomous' means having the ability to independently control oneself, free from interference. When applied to Level 2 and Level 3 vehicles, this is clearly not true, as both types of vehicles can function with only limited independence, in specific environments, and operate with the expectation that a driver can intervene if things turn awry. This has consequences in relation to how the automotive industry markets autonomous vehicles, and how customers perceive them. With the Audi AI traffic jam pilot, the brand with the four rings presents the world’s first system that enables highly automated driving at Level 3. The car takes over the task of driving in certain situations. Unlike at Level 2, the driver no longer needs to monitor it permanently. They must merely be capable of taking back responsibility whenever the system prompts them to. The driver activates the traffic jam pilot with the AI button on the center console. On freeways and highways where a physical barrier separates the two carriageways, the system takes over the driving task if the car is traveling at less than 60 km/h (37.3 mph) in nose-to-tail traffic. The traffic jam pilot manages starting, accelerating, steering and braking. It can also handle critical situations such as vehicles cutting in closely in front. The signals that the traffic jam pilot needs for highly automated driving are supplied for instance by the central driver assistance controller (zFAS). With the traffic jam pilot active, the driver can relax. They can take their hands off the steering wheel permanently and, depending on national laws, focus on a different activity that is supported by the car, such as watch a TV program on the 10.1-inch display in the center console. In this instance the Audi virtual cockpit supplies abstract representations that symbolize the motion and surroundings of the new A8. The errors in this press release begin with the description of the A8's capability for 'highly automated driving.' As per the SAE standard, high driving automation is classified as Level 4. Whilst the term 'highly automated driving' has an element of subjectivity to it, and Audi is free to market the A8 as it sees fit, it's misleading to obfuscate the subjective 'highly automated driving' with the term 'high driving automation', that has a defined meaning that the A8 does not meet as per the SAE standard. Driving tasks performed (Dynamic Driving Task, or DDT): "The traffic jam pilot manages starting, accelerating, steering and braking. It can also handle critical situations such as vehicles cutting in closely in front." Operational environment (Operational Design Domain, or ODD): "On freeways and highways where a physical barrier separates the two carriageways, the system takes over the driving task if the car is traveling at less than 60 km/h (37.3 mph) in nose-to-tail traffic." Extent of human driver involvement required (DDT fallback): "During highly automated travel a small camera in the driving area detects if the driver tires or falls sleep. If that happens, a multi-stage warning is given. As soon as the speed rises above 60 km/h (37.3 mph) or the line of vehicles breaks up, the traffic jam pilot informs the driver that they need to take charge of driving once again. 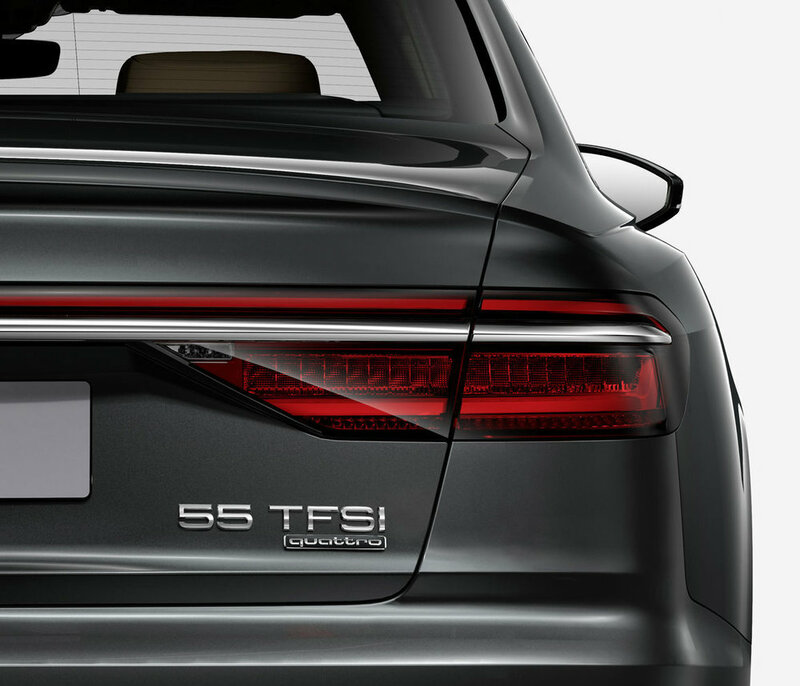 If they ignore this prompt and the subsequent warnings, the new A8 is braked to a standstill." 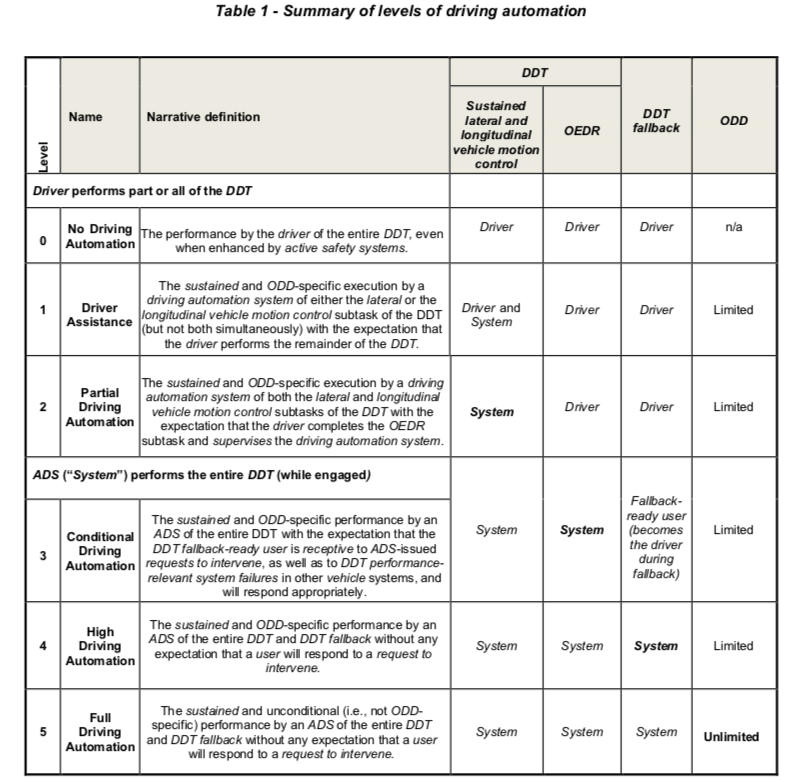 For a car to have Level 3 automation, the SAE suggests that it must have control of all driving tasks within the specified operating environment. Audi suggests the A8 manages starting, accelerating, steering and braking, on dual-carriage highways with a separating physical barrier, when the car is travelling at less than 60 km/h. However, the company makes no mention of other DDTs such as changing or merging lanes that are often necessary in the operating environment that Audi describes. Furthermore, whilst the SAE standard doesn't prescribe any suggestions for the type of ODDs that Level 3 vehicles should be able to operate in, the operating environment of Audi's autonomous driving system is remarkably limited. 60 km/h is a very low operational speed limit, and effectively means that Audi's system works only in stop-start traffic jams on highways. In light of the very limited scenarios that Audi's system can actually work in, it is not significantly different from existing adaptive cruise and lane-keep assist systems widely available today. The SAE should rephrase the six levels of autonomous driving, such that terms such as 'autonomous vehicles' and 'driving automation' apply only to Level 4 and Level 5 vehicles. The technologies offered in Level 2 and Level 3 vehicles are, for all practical purposes, driver assistance technologies rather than autonomous driving technologies. Categorising these vehicles as having 'driving automation', when in most practical situations they require human supervision, can create the potential for misleading marketing, as evidenced by the Audi A8 above, and consequently create customer confusion and overconfidence in the technology available today. Ultimately, there is no commercially available autonomous car on sale today. From 0-40 km/h the Forward Collision Warning (FCW) system will warn the driver of an impending collision. Above 40 km/h, the Autonomous Emergency Braking (AEB) system will apply the brakes if it detects an impending collision. There is no upper speed limit after which the system will not work, however, the likelihood of the car coming to a complete stop before the potential accident will decrease at higher speeds. I'm not sure why the particular Model X tested by CarAdvice did not have AEB. Even if the Model X tested was an older model, I would assume that Tesla's fleet of loan/review cars is kept up-to-date with the latest software. I will update this article if I receive further information on the particular Model X used by CarAdvice. It's important to note that the key point of the article, that essential safety features such as AEB should not be compromised in favour of software development, remains valid. From October 2016 towards the end of April 2017, new Tesla vehicles sold did not have any form of AEB. "But here is the problem. While we had the car on loan, all the data collected by 'Hardware 1' Tesla vehicles is obsolete. Hardware 1 was Tesla's first iteration of cameras and sensors used for AutoPilot, autonomous emergency braking and radar cruise control. Now that the camera and sensor count has increased, all of that 'self learning' data is wiped and new data needs to be collected. With other car brands, they test this technology first, implement their learnings and release the vehicle to market. Tesla, instead, uses its customers effectively as test pilots until it has enough data to enable those features. That means our test car didn't have features like autonomous emergency braking, automatic high beam lights, automatic windscreen wipers, side collision warning, lane departure warning, high-speed automatic steering, automatic lane change, semi-autonomous parking and Tesla's Summon self-parking feature. You read that right – this car, with an on-road price tag of over $180,000 doesn't have automatic windscreen wipers. That's technology standard on a $20,000 Mazda 2 – even the entry-level $14,990 Mazda 2 has autonomous emergency braking as standard. We don't really care what excuses Tesla has for this technology being non-existent at the moment, it's not good enough. It's not good enough for a $50,000 car, let alone one worth almost $200,000. 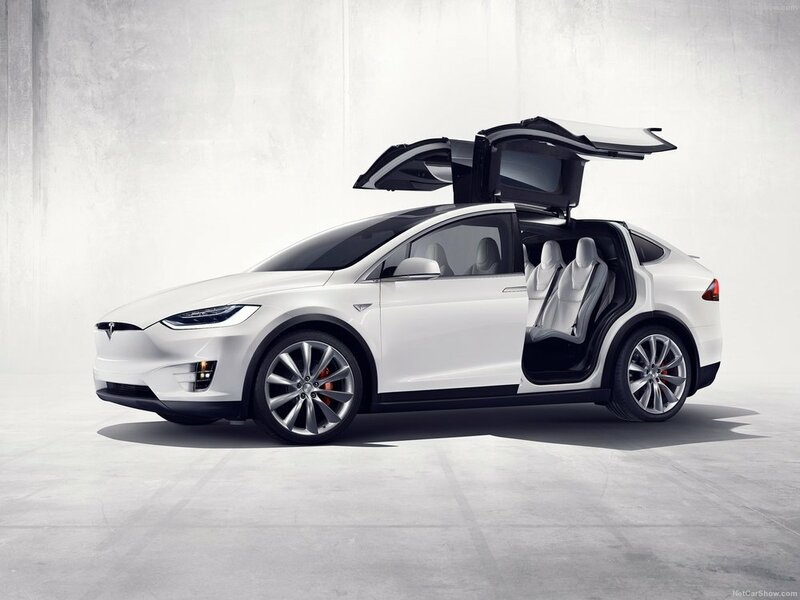 Even the top-specification Model X P100D worth over $300,000 doesn't have this technology. You're kidding, right?" It's understandable that Tesla, as a new player in the automotive industry, needs to be seen as technologically ahead of other automakers to differentiate itself. It's also understandable that in order to maintain this lead, the company will frequently trial and test beta software. However, basic safety features should never be compromised in favour of software development. When a $14,990 Mazda 2 right at the budget end of the market comes standard with AEB, it's fair to say that the industry across the board can and should deem AEB a safety feature as essential as an airbag. For a $180,000 car to not have this feature is shameful. It doesn't matter whether the Model X will have this feature soon, or has had it in the past, or that this is a temporary problem. AEB is now a feature so essential that there should never be a point in any vehicle's life-cycle where it is not standard. The fact is, if you walk out of a Tesla showroom right now with a Model X, you cannot have AEB. Tesla has compromised on a crucial safety feature today in favour of better autonomous driving at some point in the future. That is inexcusable. At this point, I have to reinforce what Paul says in the second paragraph of the quoted excerpt. Tesla may be one of the few (if not the only) manufacturer that delivers seamless, over-the-air software updates to improve their car, much like how Apple updates the iPhone or Google with the Pixel. It should rightly be applauded for this. But other manufacturers also don't remove safety features from their cars and then use the customer as a pawn when developing their replacements. Instead, they take time to develop and throughly test these features to a point where they reliably work well before selling the car to the customer. A comparably priced car from another manufacturer may not have software that will be improved in the future, but it will also come out of the box (so to speak) with essential safety features like AEB that will reliably work well, and won't be removed in the future. 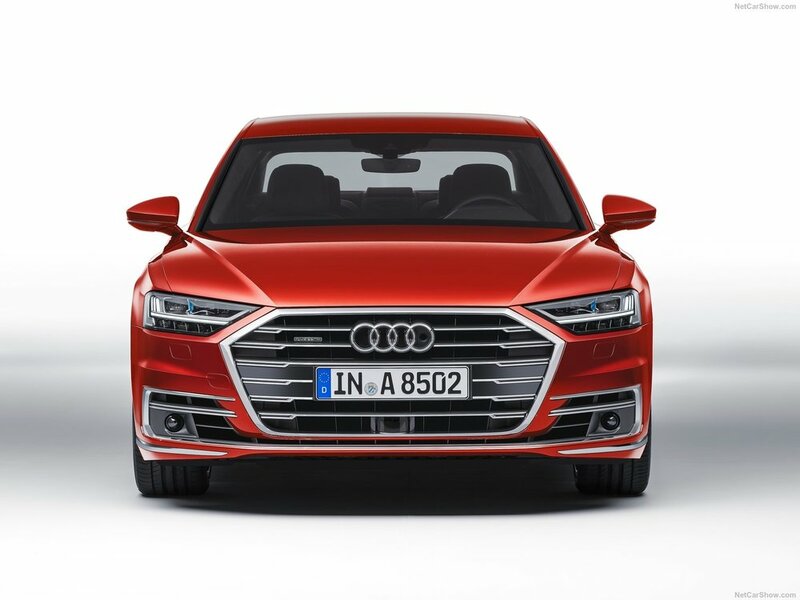 To compare with the approach of a conventional manufacturer, look at the new Audi A8 that has recently been launched. This vehicle today arguably has a superior autonomous driving ability than Tesla's Autopilot. I'm sure Audi could have launched this car 18-24 months ago without AEB or any self-driving features, and then have progressively implemented those features via software updates as it developed its self-driving technology. Instead, Audi took the development time and resources to ensure that these self-driving features work reliably well from the first instance that customers use them. The company is even confident enough with this technology to accept liability if the vehicle crashes whilst driving itself. There's little doubt that Tesla's focus on technology and making great electric vehicles has caught the attention of the wider public, and has pushed the rest of the industry to compete. However, putting the customer's safety at risk today, by removing AEB, in order to develop self-driving software that will be available at some vague point in the future, is an act by Tesla that is reckless and almost criminal.